Nabi Musa lies 11 km south of Jericho and 20 km east of Jerusalem in the Judaean wilderness. It is considered by popular Muslim tradition to be the grave of the prophet Moses. This large walled complex includes 120 rooms, a large number of white domes above its roofs, and a high tower. Nabi Musa is located at what would be have marked the end of the first day’s march from Jerusalem to Jericho in the direction of Mecca via the ancient road passing Nabi Musa on the south side along the Nahal Og Creek. A large building marks the Mausoleum of Moses, according to Muslim tradition. Nabi Musa was also simply a lookout point from which pilgrims could look across the Jordan Valley and catch a glimpse of Mount Nebo where, according to the Bible, Moses was buried, but the grave site is unknown. Muslim tradition holds that Saladin had a dream which revealed to him the site where the prophet Moses was venerated and subsequently he built a cenotaph (an empty tomb) and on top of it a mosque. The site is surrounded by bituminous shale rock, from which the Bedouins extracted oil. This rock gave the hill a reddish color which was easily seen from the ancient road. Muslim tradition holds that the tomb has been the site of annual pilgrimage since the time of Saladin. The main body of the present shrine, mosque, minaret and some rooms were built during the reign of Al-Dhaher Baybers, the Mamluk Sultan, in 1269 AD and many devout made the pilgrimage from Jerusalem to Nabi Musa. The annual of Nabi Musa festival attracted thousands of believers every year. In 1820, the Turks restored the building and encouraged the 7-day pilgrimage, which started from the Al-Aqsa mosque in Jerusalem and lasted a full day until the arrival in Nabi Musa. The seven-day Muslim religious festival was celebrated annually by Palestinian Muslims beginning on the Friday before Good Friday according to the old Orthodox Greek calendar. The festive Muslim pilgrimage to the shrine would always coincide with the Christian celebration of Easter, giving Muslims a way to celebrate during the same season in which their Christian neighbors were celebrating. In February 1918 the British forces (a New Zealand unit) overcame the Turkish army who had been using the place shrine as a fortress and had positioned five cannons that shelled the open valley, temporarily blocking the advance of the British to the east. In the 20th Century these festive gatherings turned political, and sparked riots against the Jewish population (Riots of April 1920). The 1920 Nabi Musa riots and 1920 Jerusalem Riots took place in British-controlled, pre-British Mandate of Palestine between Sunday, 4 and Wednesday, 7 April 1920 in and around the Old City of Jerusalem. The riots coincided with and are named after the Nabi Musa Festival and followed rising tensions in Arab-Jewish relations. The events came shortly after the Battle of Tel Hai and the increasing pressure by Arab nationalists in Syria on the course of the Franco-Syrian War. The festival was suppressed when Jordan assumed administration over the West Bank in the aftermath of 1948 Israeli War of Independence, because of its symbolic value as a vehicle for potential expressions of political protest.The site is in Israeli control since 1967. Since 1995, religious control over the tomb of Nabi Musa has been allocated to the Palestinian National Authority. Nabi Musa is easily approached from Highway #1 (Jerusalem to Jordan valley). The shrine is open to the public, so a short visit to the shrine and to the observation point just east of Nabi Musa is a nice detour on the way. 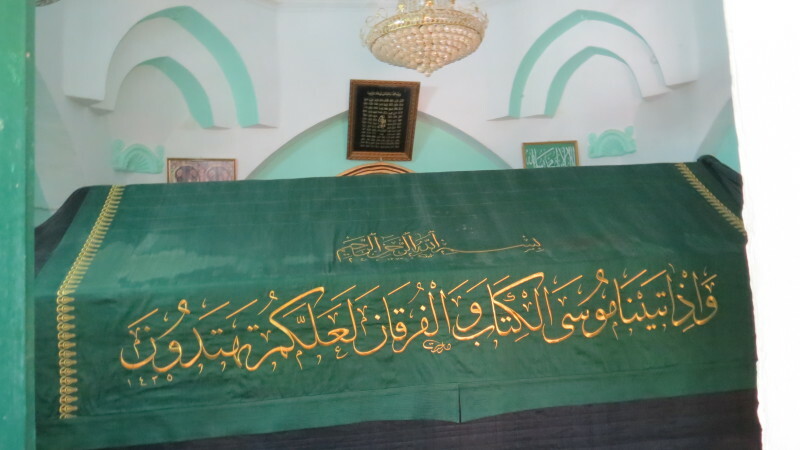 A Mamluk inscription on the wall reads, “The construction of this Maqam over the grave of the Prophet Moses who spoke to God was ordered by his majesty, Sultan Dhaher Abu El-Fateh Baybers, in year 668 Hijri (1269-1270 AD)”. The double-domed structure, 2 km south of Nabi Musa, is identified by Muslim tradition as the Tomb of Hasan Al-Rai the shepherd of Moses. The allegory of Moses and the Shepherd is a story from the poet Rumi’s work Masnavi. The story is a Persian poem about a conversation on the condemning by Moses of the shepherd’s devotional prayer. There is also a large cemetery located in the fields around the complex for the Muslims who died during the festivals.